congrats, you (almost) made it through january! you deserve cake. maple persimmon upside down cake, because upside down cakes never go out of style (see here for a caramel banana version) and because it’s persimmon season. the majority of the content you see is created when i’m home on break, so sometimes there’s a massive gap between when i shoot the pictures and when i post them. i’m definitely not a perfectionist, but i find myself in a cycle of liking my pictures upon capture, and then disliking them when i actually go to post. but when i debate reshooting and posting later, it’s a matter of 8+ months later. because persimmons aren’t in season in june, aka summer break time. tl;dr: take these photos with a grain of salt, but i promise that this cake is delicious (bc pics are important, but what i really care about is how the recipe actually tastes). 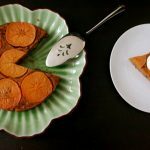 anyways, this maple persimmon upside down cake is on the sweeter side, so serving it with unsweetened whipped cream or greek yogurt is perfect. i’ve cut the original amount of syrup down slightly, but i’d be loathe to cut it more since that’s what helps give the cake a really pleasant moistness. i love how soft (but not mushy!) the persimmon gets, and i’m convinced that everyone should cut persimmons crosswise from now on bc THAT STAR PATTERN. This maple persimmon upside down cake features maple-scented cake and tender persimmons for an easy but still impressive looking (and tasting!) cake. Melt 2 T butter and 2 T maple syrup in a 10” cake pan or cast iron skillet over low heat. Remove from the heat. In a bowl, whisk together the dry ingredients. Beat 6 T butter and 3/4 cup syrup until thoroughly combined (this may take days). Add the eggs, and beat for 1 minute. Add half of the flour mixture and beat for 10 seconds. Add the buttermilk and beat for 10 seconds. Add the rest of the flour mixture and beat just until combined. Fold in the pecans. Swirl the cast iron pan to make sure the sides and bottom of the pan are thoroughly coated. Cover the bottom of the pan with concentric circles of persimmons. Pour the batter over the fruit, and smooth out the surface. Bake at 350F for 45-50 minutes, until browned slightly and a knife inserted in the middle comes out with moist crumbs. Cool in the pan until it can be handled without oven mitts. Using a thin knife, gently loosen the sides of the cake. Invert onto a serving plate. Serve slices of cake warm with whipped cream, yogurt or creme fraiche. If you don’t have a 10” round vessel, you can either have multiple, smaller pans on hand or half the recipe and bake it for 30-35 minutes in an 8” round pan (the cake pictured here is 8"). it seems silly to talk about cake considering the current political and social climate in the us. do what you can: donate, talk, contact your congress members (even if you think they’re in safe districts), protest (peacefully). but in that same vein, i’m betting you get enough politics through your circles and irl advocacy, and i’d like to keep this an escape. tl;dr: i’m going to mention it now, but it’s not going to be in every post AND just because i don’t talk about it doesn’t mean it’s forgotten or that it doesn’t matter. I bought too many persimmons to eat before they go bad. This is a great idea! Thank you! no prob! it’s confusing (like yam and sweet potato?! i never remember the differences between those two). I usually just have them in salads but I love the idea of putting them in an upside down cake! I have the same issue, i usually like what I shoot then I go to post and I can’t stand to look at them. whoa, normally i don’t have them in salads (usually just plain and raw bc they’re so good like that already), but i’ll have to next time i get my hands on some! maybe the moral of the story is to shoot then post immediately lol. What a lovely treat! I’ve honestly never used persimmons before but I’ve always wanted to so I’ll have to try this sometime! i love persimmons plain and raw to munch on, so i only bake with them when i have a ton! besides this cake, i really like making persimmon bread (though they use different kinds of persimmons). Wow! 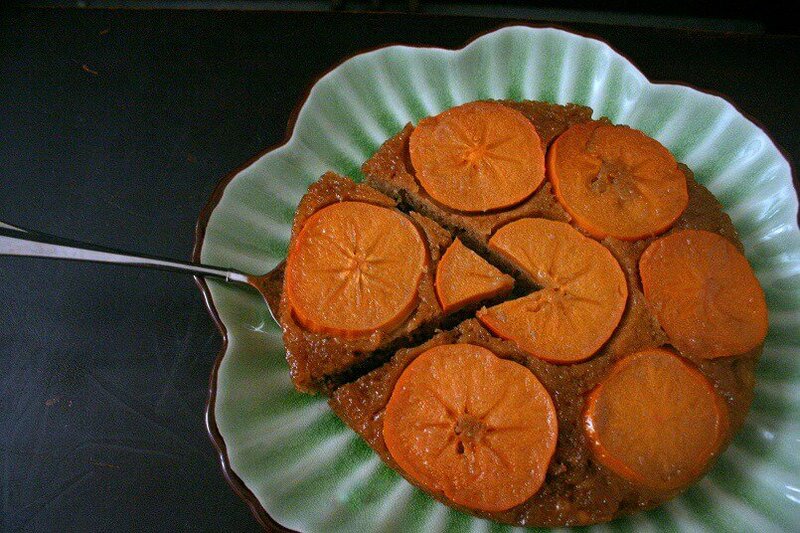 Never thought of making an upside-down cake with persimmons! This looks gorgeous. thanks! i feel like any firm-ish fruit does well in an upside-down cake (i mean come on, cake and caramel?! can’t go wrong). Ain’t that a pretty little lady! And yes, I just called you cake a lady – ha ha! lol thanks! there’s prettier cakes/cake ladies/lady cakes out there, but this one is the relaxed weekend edition who just wants to kick back. Love this idea! I love persimmons AND upside-down cakes. For sure, I’ll try and find persimmons when it’s in season here and will try this recipe. I love fruits and it’s likely I’ll like it too. oooh i hope you get to try persimmons soon! they’re usually available oct-feb in california, but not quite sure what the season is like outside of the state. my favorite kind is fuyu (more round), since it’s firm and kind of crunchy, versus the mushier hachiya (more oblong/long/pointed). they’re both super sweet and tasty though! This cake is lovely! 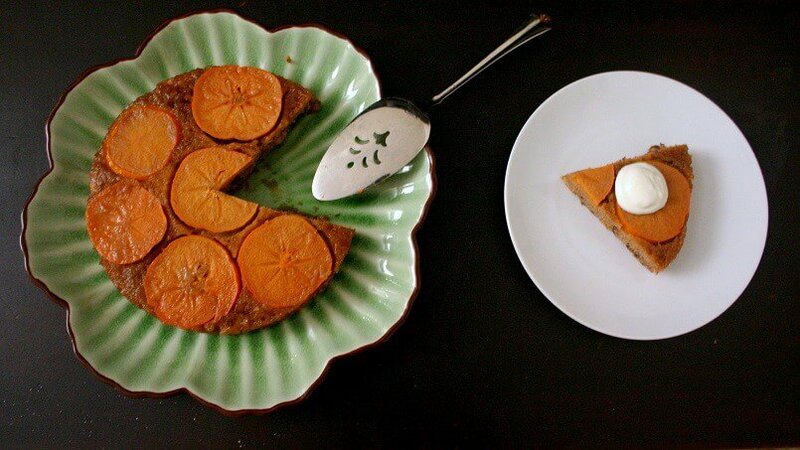 Persimmons are gorgeous fruits and this is such a creative use of them! Can’t wait to try this! Love the sound of this cake! I am so fascinated by Persimmons, but I still don’t know how to pick them. I have had 3 bad experiences this season and then I gave up. But will bookmark this one for when I finally learn to pick them! What a pretty cake! I love the idea of sweetening the cake with maple syrup. I wish I had a slice of this in front of me right now!